So, I bought this pretty looking bath jelly from LUSH Cosmetics along with the LUSH shampoo Bar : Godiva 2-in-1. It's so blue and citrusy <3 read my review here. ive you a wake-up boost. Our triple-citrus wobbly wash gets you squeaky clean with its invigorating and energizing blend of fresh lemon, lime and grapefruit juices. And just in case your mental faculty is really struggling, we’ve thrown in revitalizing rosemary and balancing geranium to kick-start your senses even more. What are you waiting for? Rise and shine and get in the shower – the world is yours and the day awaits! Shower jellies are some of our most innovative products and there are many fun ways to use them. You can crush them into a shower pouf to create a rich lather or rub them directly on your body. Try freezing (or chilling) them for an especially cool, refreshing shower or bath experience. Shower jellies also make great shampoos and add lots of softness and shine to hair. 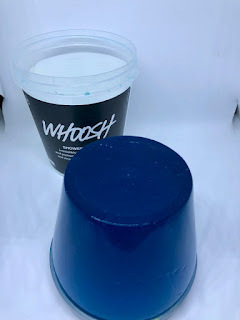 LUSH Whoosh Shower Jelly Review: Looking for a little fun in the shower? Then this is for you! Whoosh – That’s the sleepy tiredness leaving your body. I was intrigued by the idea of jelly and had to give it a go. 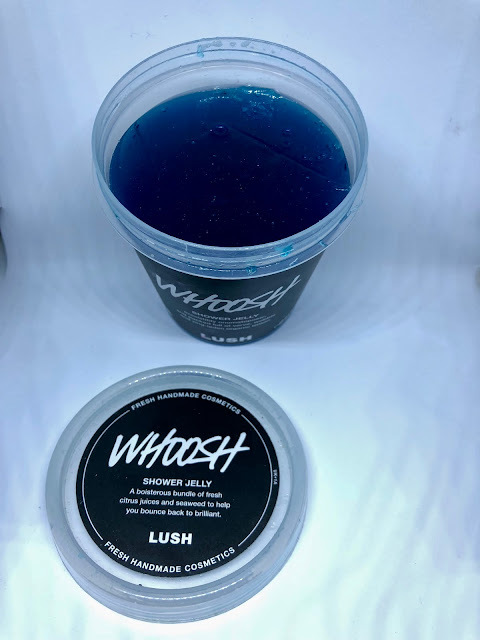 This is my first ever shower jelly from LUSH. 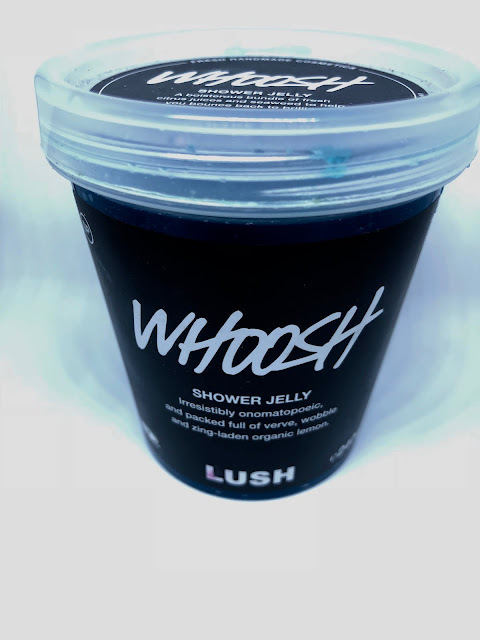 The shop had a crumbled up whoosh on display for testing and the clear teal jelly caught my eye and the refreshing smell I couldn’t pass without buying it. The product comes in a transparent wide-mouthed recyclable tub With a screw on cap. You can see the actual product inside. As it's Infused with triple citrus scents, the jelly smells refreshing and citrusy. It has a strong smell that is more of a summer use jelly as the smell reminds me of lemonades. But by all means, you can use this one all year round. It is a blue slightly teal jelly. You can scoop just a little amount out or just use it as it is. The jelly has the perfect jiggle and wobble. It retains its shape and is flexible. You can tilt the tub over and the jelly will slip out in perfect shape. The jelly lathers up just fine. Of course, if you are used to of using shower gels/ butter you will find the lather way too less. But it instantly starts lathering as you work it against your skin. This is a Head to toe wash product. I would never recommend using this on hairs, it makes your hairs way too dry. It just works fine and leaves skin super soft BUT I do need to use any lotion/yougurt/ moisturizer afterward. I had a lot of fun with the jelly while in the bath. There are a lot of ways to use this jelly. Chill it in the fridge or chuck it in the freezer. You can also chop this jelly and use a bit every time you shower. Or you can crumble the jelly and put it in your loofah and lather it up. Or you can just use the whole as you would with a soap and rub over your body. The jelly is too pretty for me to crumble it on purpose, I will use it multiple times and if it crumbles on its own then that’s that.